Most potentially-harmful chemical and biological drinking water contaminants can be eliminated or reduced dramatically with a gravity water filtration system. The net result is cleaner, safer and much better tasting drinking water -- no more terrible-tasting chlorine and other contaminants. You're going to like the way your water tastes! Gravity filtration systems require no electricity to operate and can purify just about any fresh water source, including tap, lake, stream, river, pond and rain water. In the event of an earthquake, flood, chemical spill, power outage or any of a variety of other potential disasters, a gravity water filtration system can serve as an emergency water supply. 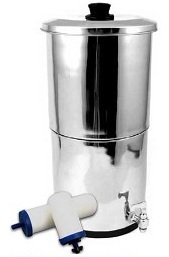 Filtering your water couldn't be easier -- just pour the water to be purified into the top portion of the system, let it slowly filter through the filter elements to the lower storage container and it'll be ready for drinking. Gravity filtration systems are ideally-suited for use in your home, office, college dorm room or vacation home. They’re also portable, so you can take them with you in your RV or on camping trips. NOTE: With the holidays coming up, a gravity water filter system might make a great gift for you and your family. Your peace of mind knowing you'll have safe and better tasting drinking water is probably worth way more than the cost of the system. So check out our gravity systems and take advantage of this offer.